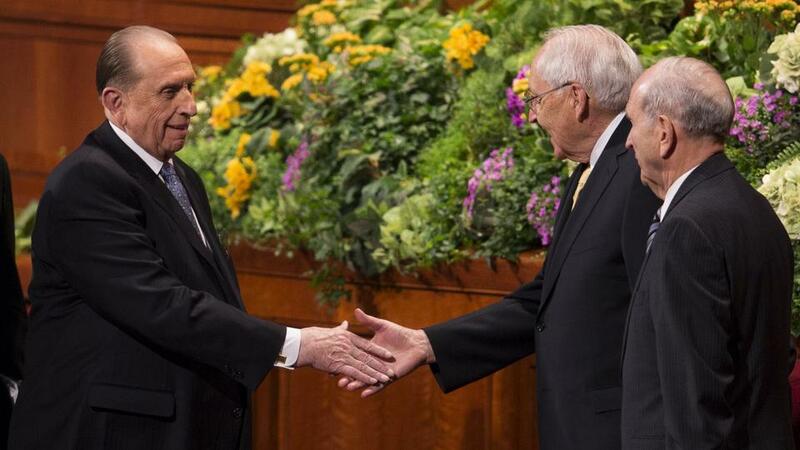 SALT LAKE CITY – The Church of Jesus Christ of Latter-day Saints announced Saturday that Elder L. Tom Perry, of the church’s Quorum of the Twelve Apostles, died Saturday afternoon at his home in Salt Lake City. Perry was diagnosed with thyroid cancer in April. 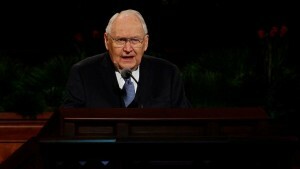 The church released a statement Friday that his cancer was terminal and had spread aggressively. Perry was 92 at the time of his death and was the church’s second-most senior apostle, in terms of length of service in the Quorum of the Twelve, and was the oldest apostle currently living. 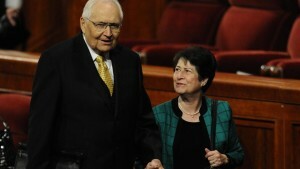 Perry was ordained an apostle in April 1974, after serving for two years as an assistant to the Twelve, according to a press release from The Church of Jesus Christ of Latter-day Saints. “Elder Perry’s commanding physical presence combined with his enthusiasm and optimistic style made him a forceful as well as a popular figure among Church members across the world,” the press release said. 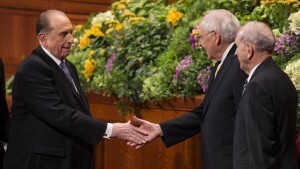 Like apostles in New Testament times, LDS apostles are called to be special witnesses of Jesus Christ, according to the release. Perry was one of 15 men who help oversee the growth and development of the church, which currently has more than 15 million members. During his church service, Perry spoke often about the importance of religion’s presence in society as well as the importance of the family and preserving religious freedom. He also worked closely with the leaders of other faiths in promoting the cause of religious freedom. “I think he’ll be remembered as a champion of the family,” his oldest son, Lee Perry, said. Perry was born in Logan on Aug. 5, 1922. He served in the U.S. Marines just after World War II, and his church service began in 1942 with a mission to the northern United States. Perry received a bachelor of science degree in finance from Utah State University in 1949 and also did graduate work there, according to the press release. He worked professionally in the retail business, serving as vice president and treasurer of companies in Idaho, California, New York and Massachusetts. Perry was preceded in death by his first wife, Virginia Lee, with whom he has two daughters and a son. She died in 1974. He is survived by his second wife, Barbara Taylor Dayton, whom he married in 1976. Details regarding Perry’s funeral arrangements will be announced as they become available, according to the press release. “It is undetermined as to when the vacancy in the Church’s Quorum of the Twelve Apostles will be filled,” the release said. I guess he really was sick. Now another 90 yr old white guy will replace him, the beat goes on.